Boris FX 10 is an effects, rotoscoping and image processing app plug-in for a variety of non-linear editors including Adobe Premiere Pro , Avid , and Sony Vegas Pro . Boris FX 10 allows editors to do slightly more complicated FX work using Boris and other Adobe After Effects compatible plug-ins, without having to go to a more elaborate FX app like After Effects. These are not new filters. The filters come from two other Boris products: Boris Continuum Complete and Final Effects Complete . This is not the entirety of those two sets, rather Boris FX 10 comes with a sizable amount from each – 225 in all. Using it is very simple. I do most of my editing with Premiere Pro, so we’ll use this for examples. Boris FX 10 is good for many things, but my favorite is transitions. Let’s say I want to do a heavily distorted circular wipe, with heavy lens distortion. In Premiere Pro I lay down the background shot on Video 1, then I add my foreground shot on Video 2. I go to Effects, select Boris FX 10.0 filter, and add it to my Video 2 clip. Under Effects Controls I find the Boris FX 10.0 Filter. To the right of the name is a small button marked Setup that looks like a pulldown menu. Clicking it opens up the Boris FX UI in a separate window. The Boris FX UI is fairly simple to navigate – timeline on the bottom, controls in the upper left-hand window, the composition window in the upper right-hand window. The Zoom upon opening defaults at 100. In order to see the entire height and width of the clip, I change my Zoom to around 45.00. I go into the Filters menu and choose FEC Lens. I go three seconds into the clip. 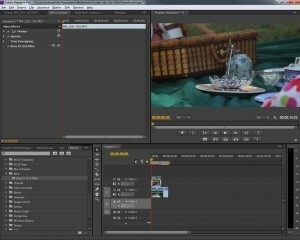 At the bottom of the composite window are various controls, including playback, zooming, onscreen controls, preview quality and resolution, and adding keyframes. I click the keyframe button. A new keyframe, represented by a circle, appears on both the timeline and the timeline on the bottom of the Composite window. I decide on a two second wipe, so I go to :05 in and add a new keyframe. Since these are Boris filters I’m working with, they have the same overlay controls I’ve become so familiar with in After Effects. I move my cursor to the keyframe at the :03 mark, adjust the Size to 100 and the Convergence to 0. point. I do a quick copy keyframe / paste keyframe for the keyframe at :00. This assures me of three seconds of unaltered video. Then I go to the keyframe at :05, make my Convergence 100 – the max for this filter, and turn size to 0. Next I delete the last keyframe under FEC Lens – 1, and click-drag the final keyframe in the bar marked Video 1 to :05 seconds, shortening my clip duration to match where I wanted the video to end. Finally I hit the Apply button at the bottom right-hand corner of the Boris FX 10 screen. If you don’t like what you’ve done, you also have a Cancel button next to the Apply button. Once Apply is clicked, Boris FX’ 10′s separate window closes and the transition is there in my Premiere Pro timeline, in place and ready to go. I haven’t even scratched the surface of Boris FX 10. It does motion tracking, stabilization, 3D shapes, motion blurs, vector painting, scrubbable audio, 16-bit color capable depending on your NLE’s capabilities, and the ability to use other third-party After Effects compatible filters within Boris FX 10. Boris FX 10 is for the editor who needs a way to use filters not necessarily meant to be used in their particular NLE. 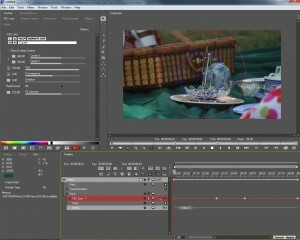 It adds in compositing, rotoscoping and effects capabilities that may not be native to their NLE. Bottom line, I am a Premiere Pro user who spends a lot of time in After Effects. Sometimes as I cut I think it would be nice to have some of the functions and filters from AE without having to go through the hassle of having both Premiere Pro and After Effects open. For this reason alone, Boris FX 10 is handy. I have a friend who is a very accomplished video editor who cuts with Final Cut Pro 7 and Premiere Pro. He has never used After Effects and is more than a little intimidated by it. Boris FX 10′s easy-to-learn user interface, mixed with a nice selection of filters from Boris Final Effects and Boris Continuum Complete, would be a definite boon to his editing and push him farther into the world of compositing and video effects. If you’ve never played around with Boris’ filters, this is a good one to check out. Boris FX 10 is available for both Windows NLEs and Mac NLEs. MSRP for it is $299.00. Take a look at Boris’s website by clicking here .